Here are five resolutions to help you have better meetings in 2019. According to a recent brand study, more than 63% of meetings have no agenda at all. Skip the bullet points and create an agenda with clear descriptions, outcomes and presenters, and enough time to effectively cover each topic. Attendees should understand what is going to be discussed so they can prepare accordingly. Commit to spend at least 15 minutes reading meeting materials and jotting down questions and comments ahead of time. Organizational behavioral studies have shown people over-rely on their gut when making decisions. By reviewing materials ahead of a meeting, you’ll be more prepared for productive conversations and thoughtful decision-making. Often, what’s discussed in one meeting is forgotten until the next. 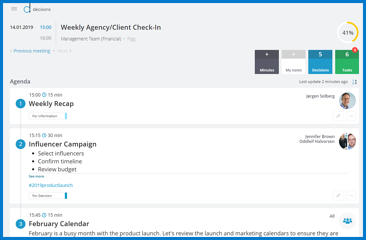 Document tasks by assigning them to people through a tool like Microsoft Planner and ensure decisions are highlighted in the meeting minutes. 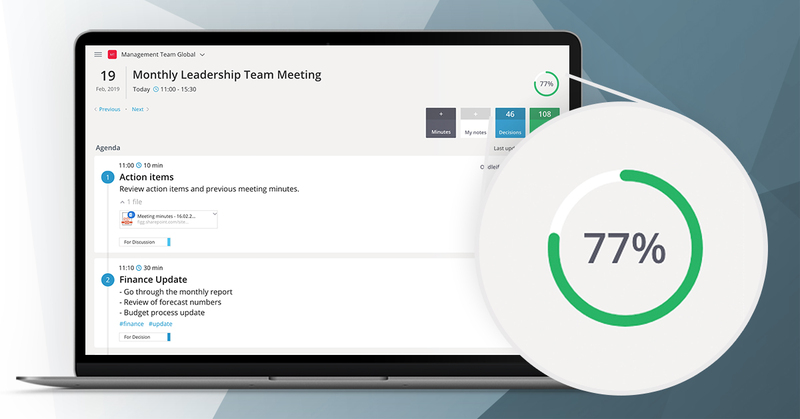 Spend the first 10 minutes of the next meeting going through the previous meeting minutes and action items. Solutions like Decisions integrate with Office 365 to make meeting management simple and effective. Make 2019 the year your organization has more successful meetings.